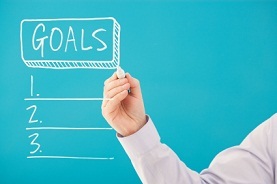 If you don’t have a concrete list of career goals, you may become stagnant in your job. Here are a few tips to help you determine your career objectives and how to achieve them.No matter what you do in life, you should have a clearly-defined set of goals to help you achieve your objectives. This is especially true in your professional life. Look at where you are now. What is your career goal? Are you happy with your current job? Is it something you want to do until you can retire? What changes, if any, would you make to your current employment situation? If you are perfectly happy with your current situation, determine how you can stay happy where you are and still progress in your career. Don’t let yourself become complacent with your situation and become stagnant and unhappy down the road. It will become more difficult to make changes if this happens. Now look to the future. Figure out where you want to be later. Then, make a list of your career goals – you can find career goals examples online to help you get started. Start with short-term career goals – determine where you’d like to be at the same time next year. Then figure out your long-term career goals and objectives. Where do you want to be five years from now? How about in ten years? And then look to retirement. What would you like to be doing when you are ready to retire? Most employers want you to progress in your career, both with training and education, and with climbing the ladder. If you become stagnant in your job and unwilling to make changes, there is a higher likelihood that they will let you go and find someone who is more motivated. Keep this in mind as you set forth your career goals. If you are job hunting, crafting a well constructed career goal statement can provide the Job Seeker with motivation, vision and direction toward future goals. As you are thinking about retirement, it’s also important to work out any issues with money and benefits. And more importantly, when would you like to retire? Will you be able to retire before the common retirement age of 60-65, or will you have to work until you are eligible for Social Security and other retirement benefits? These are important questions that you must answer so you can make better choices. Now that you’ve determined your career goals from your list of career goals examples, you need a plan of action. Make a list of education and training that you’ll need to attain your career objectives. Do you need a college degree or an advanced degree? How about vocational courses or seminars that are related to your career field? Next, determine what jobs you’ll need to take to reach your career goals. Maybe you need to start with an entry-level job and work your way up the ladder. And after you determine what you need to do to get where you want to be, set a time table for completion of your career goals, but remember that plans can change, and don’t be too hard on yourself if you don’t complete everything on time. Establishing your career goals can be difficult. That’s why it’s important to let a professional help you. The staff at GoGetterCareers.com can provide you with the tools necessary to assist you with your career objectives and can connect you with career testing, career coaching and career counseling services. We offer many services for job seekers and employers. GoGetterCareers.com can connect you with professionals that will work with you to develop your Career Goals and Career Objectives, contact us today and get started on your path to success!